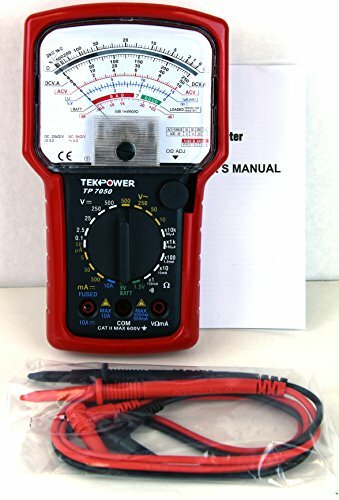 Compare with TP7040,the Tekpower TP7050 is a 20-Range Analog Multimeter with Battery tester while TP7040 does not have it, you can use it to measure AC/DC voltage, DC current, resistance, continuity, decibel values/dB and diode test. This meter is well known for its accuracy at its low DC voltage and current measurement, they are 0.1V, 2.5V, 25V,250V and 500V. For DC current, you can measure current as low as a few micro amps using the 50 micro amp range with 3% accuracy. *Dimensions: 7 1/2" X 4 1/4" X 1 1/2"
*Fuses: 250 mA / 250 V & 10 A / 250 V.